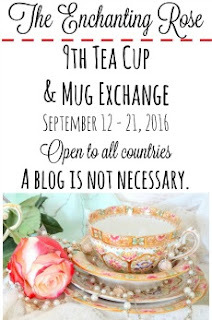 Hello friends, I'm so happy to be joining Stephanie at The Enchanting Rose for her 9th annual Tea Cup and Mug Exchange. This is my fifth Tea Cup and Mug Exchange that I have had the pleasure of participating in. It's always fun to receive a fun tea cup or mug with assorted goodies and to make new blog friends. I was assigned to send my package of goodies off to Susan who lives in Virgina. Susan has a blog called Culinary Envy where she shares all of her wonderful recipes. I hope to sometime make a few of her fun recipes. I'd love to show you the awesome package of goodies I received in the mail from Lynda, who was assigned to me. When I opened the box, Lynda had all of the contents wrapped up so nice in all different colored tissue paper. I was gifted with coffee, tea, cookies, and a pretty tea mug. Look at the pretty tea mug, it was made in Portugal. 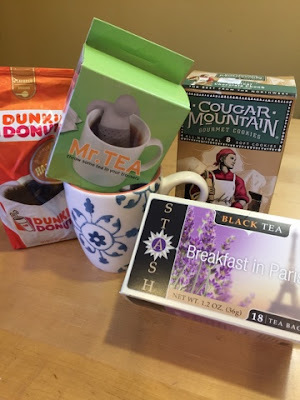 Thanks Stephanie for taking the time to arrange this fun tea cup and mug exchange. You can visit Stephanie's blog HERE to see what other people received. What a beautiful mug she sent you! It depicts one of the typical tiles in Portuguese houses called "azulejos". Those goodies look yummy. Enjoy them! This is so fun! Love the mug and you got coffee and tea! Mmmm... what a delicious array of coffee and tea :) Perfect for the colder months. The mug you received is beautiful, my friend! I love that it was made in Portugal. Thank you for once again joining the fun - you are a dear. Hugs to you! What fun to receive a pretty mug and all the goodies. I will surely go and visit her blog. Have a wonderful week Julie! So pretty and what a fun exchange. I might think about hosting one of these on my blog in the new year. What a fun exchange and what a cute mug you got. Have a great day Julie. Such a pretty mug! I'm sure you'll love using it for tea or coffee. Have a great one Julie! Lovely mug! This swap is so much fun! I've participated in several myself! I love blue and white ... great mug! Fun exchange. 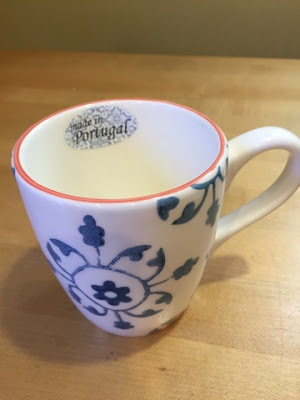 Hi Julie, what a darling mug you received from your new friend and made in Portugal. I love the blue and white. What a timeless treasure. The tea, coffee and goodies are a treat to receive and be such a joy with cooler days ahead. Hasn't this been a fun exchange? Stephanie did an amazing job once again and blessed us all with her efforts. You received a unique mug and a nice variety of tea and coffee to drink in it. How fun to get such a great package in the mail! Such a beautiful package and some delightful looking teas and coffee. How special that your mug was made in Portugal. Love your new mug and treasures! What a joyful exchange Stephanie creates for us all. Oh Julie, I love your new mug, along with all your special gifts to enjoy. Isn't this the best fun? Stephanie is such a dear to organize all this with such a kind, giving heart. Such a pretty mug. Love the pretty blue pattern. Enjoy all those goodies. Such a pretty mug! Kindness like this is so lovely isn't it! I always love these exchanges! It's such a great way to meet new friends and get something really neat that you'd never buy for yourself. So pretty! What a wonderful gift! Love this tea party! I'm sure that the tea and coffee taste better in your pretty mug. Mr. Tea made me smile.